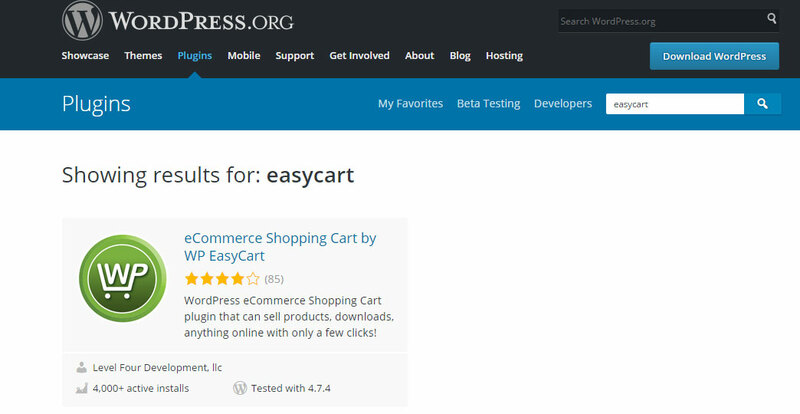 EasyCart is available for download from the WordPress plugin repository. The plugin is available for FREE, with the option to upgrade to the professional version. Professional users get support, extensions, and extra features that are not accessible in our FREE version. There are 2 methods to download and acquire EasyCart. You may search WordPress.org plugins and download the .zip file, or you may search from your WordPress plugins page and install directly at your site. Simply log into your WordPress admin console for your website and navigate to the plugins -> Add New. Search for ‘EasyCart’ and click install. This is the simplest and easiest method to download and install EasyCart. Visit www.wordpress.org -> plugins and search for ‘EasyCart’. From here you may download the .zip file that contains EasyCart. Once you have the software, you may log into your WordPress admin -> Plugins -> Add New. Press the ‘Upload Plugin’ button at the top of the page and upload the .zip package you downloaded from WordPress.org. Once installed, you should ‘activate’ the plugin by pressing activate. You can view all active plugins in your WordPress admin -> Plugins section of your website. During activation, EasyCart will construct all of the database tables, construct file and folder structures, and configure necessary settings to run on your server. Once installed, you can walk through the 2 minute installation wizard that will help you configure your taxes, shipping, payment gateway, and get you started to setting up your first product. You may choose to setup later this wizard, but it is a nice way to setup your necessary 3 pages to get started (store, cart, and account pages) and to also get initial settings right. We recommend you walk through this process, and at anytime, you can go to the settings directly and edit your taxes, shipping, and payment setup as well. 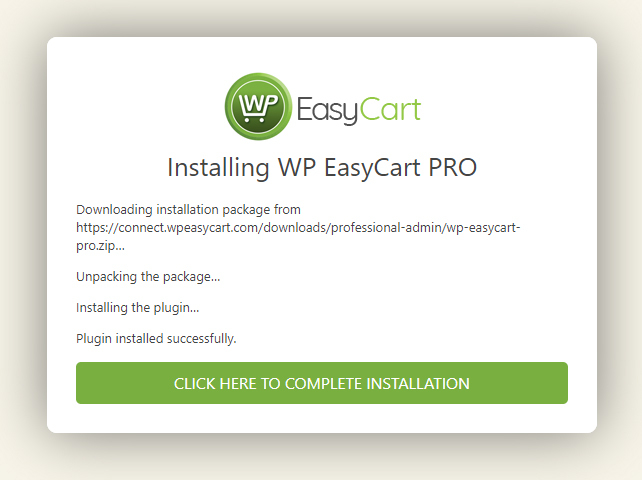 WP EasyCart can automate the installation of the Pro, Premium, & Trial systems for you. To install a free PRO trial for 14 days, simply use any of our banners to start the automated installation and activation of a trial. You must have the main core plugin installed above to see these banners all around the WP EasyCart admin console. Once you start the trial installation, it will download and install as shown below. Simply click the ‘Click Here to Complete Installation’ button and it will activate your 14 day trial Pro edition. If you would like to upgrade to the Professional or Premium edition, simply visit your registration page to start this process. You can easily go from FREE -> Trial -> Pro OR Premium from your registration page anytime. No data is ever lost when you upgrade or go from a Trial -> Pro or Premium. We simply unlock your site to give you the platform you need. If you purchase directly from our website a Professional or Premium edition, you can also manually install your .zip plugin file and register here on our registration page. WP EasyCart PRO is installed ALONG SIDE WP EasyCart, which was installed above. WP EasyCart PRO and your license key will add all the features that are locked in the WP EasyCart FREE version. This guide assumes you have already purchased WP EasyCart PRO OR started a FREE TRIAL here. 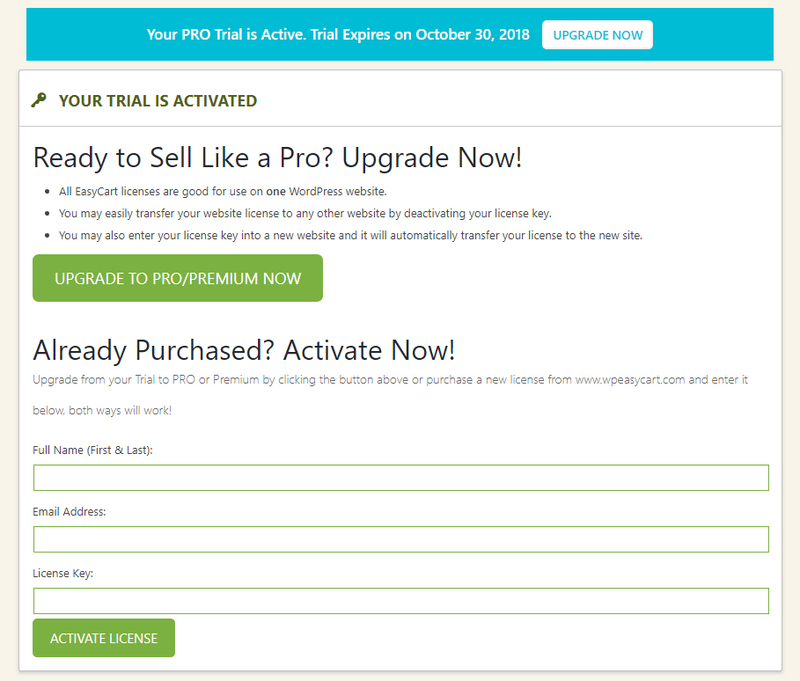 If you started a trial, WP EasyCart PRO plugin can be downloaded directly from your trial success page or the email sent to you when you started the trial. 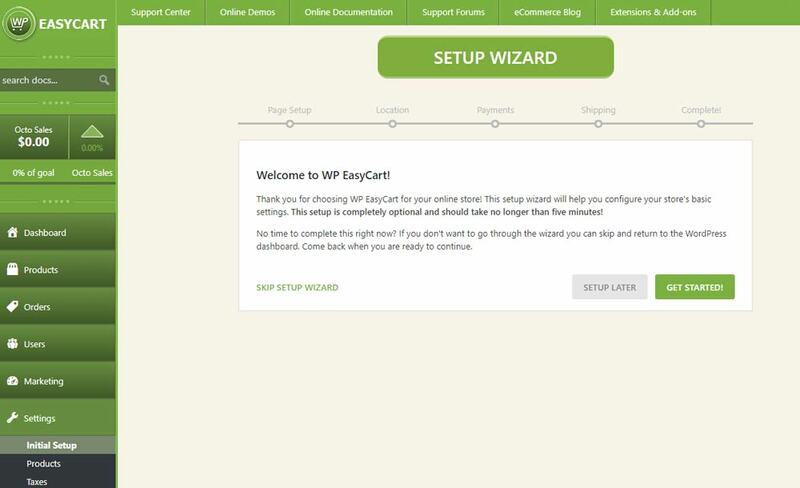 If you purchased WP EasyCart Professional or Premium, the WP EasyCart PRO plugin can be downloaded from the order success page, email receipt, or from your WP EasyCart account here. If your server has a difficult setup or more tight security options, you may have to upload the file using FTP access or through a file manager tool. If this is your situation, the entire wp-easycart-pro folder, found within the zip, can be uploaded to your wp-content/plugins/ folder. Find the wp-easycart-pro-x.x.x.zip file that you downloaded on your trial start or plugin purchase. Select the ENTIRE ZIP FILE, NOT THE PHP FILE INSIDE. Click “Install Now” to upload the zip, WordPress will extract this to your WordPress plugins folder. Click “Activate Plugin” to complete the installation, you will be redirected to the WP EasyCart registration page at this point.